The Listeria monocytogenes outbreak linked to Blue Bell ice cream has sickened 10 people and killed three of those patients. The FDA has issued a report on each of Blue Bell’s facilities after extensive inspections and investigations. We told you about the Brenham, Texas facility inspection report last week. Now here are details on the Broken Arrow, Oklahoma facility. The initial recall of Blue Bell ice cream was for product made at the Brenham facility. But officials in Kansas conducted an investigation at the Via Christi hospital kitchen after a Listeria outbreak there earlier this year. 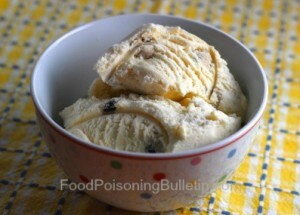 An unopened single serving cup of Blue Bell ice cream taken from the hospital kitchen contained the pathogenic bacteria. That ice cream was made in the Broken Arrow plant. The inspection report states that Institutional Chocolate ice Cream in a 3 ounce cup tested positive for Listeria monocytogenes. Blue Bell voluntarily recalled all of its institutional ice cream in 3 ounce cups on March 23, 2015. This recall was expanded to include all products manufactured at that plant on April 20, 2015. The inspection report is very revealing. FDA found that Blue Bell did not perform microbial testing “where necessary to identify sanitation failures and possible food contamination.” Specifically, environmental testing on April 22, 2014 did not sample food contact surfaces, did not determine any preventive action needed in response to the possible contamination, did not determine impact of products made on that date, and did not conduct a “Root Cause Analysis” of why the cleaning treatments were inadequate. The procedure used for cleaning and sanitizing equipment and utensils was not adequate. The plant continued to have presumptive positive environmental test results for Listeria and elevated total coliform results following the daily cleaning and sanitizing. Coliform bacteria are found in feces and are an indicator of bacterial contamination. Specifically, Listeria bacteria was isolated from samples taken on the floor in front of the freezer, in a tub in the kitchen, in the 1/2 gallon filter, in the water hose in front of the pint filler, and on the floor between the freezer and pint filler. Total coliform greater than 20 Colony Forming Units per milliliter (CFUs/mL) was identified in the finished product, in-process product batches, and raw ingredients in six samples were found in April 2014, January 2015, February 2015, and March 2015. The Oklahoma Department of Agriculture has a requirement of 20 CFUs/mL or less in finished frozen dairy desserts. In fact, in April 2014, total coliform sample results were as high as 105 CFUs/ML in the Institutional Vanilla Ice Cream cups. Homemade Vanilla ice Cream had 34 CFUs/mL, and Pineapple Sherbet had 33 CFUs/mL. In January 2015, Dutch Chocolate Ice Cream had 124 CFUs/mL. And in February 2015, Dutch Chocolate Ice Cream had 275 CFUs/mL; Homemade Vanilla Ice Cream had 840 CFUs/mL. One batch had Too Many to Count CFUs/mL. In addition, the plant failed to provide running water at a “suitable temperature for cleaning” equipment, utensils, and food-packaging materials. Water temperature for washing was not continuously monitored, verified, or documented. And “the plant is not constructed in such a manner as to prevent drip and condensate from contaminating food, food-contact surfaces, and food-packaging materials”, which was the main problem in the Brenham, Texas plant. And there’s more. Employees did not wash and sanitize hands thoroughly after each absence from the work station. One operator was observed lifting and pouring orange puree into the Flavor Tank that contained sherbet from buckets that were stored on wet wood pallets with black mold-like residue and stains. the operator picked up buckets by the bottom. His fingers contacted the top rim and inside of the puree buckets, possibly contaminating the surface. And employees wore shoes outside and then went into the sanitary production areas without cleaning their shoes first. Finally, the facility did not hold foods at the proper temperatures. In April 2014, there were several elevated temperature events above 45°F in unpasteurized milk products used as raw ingredients, including chocolate stored in the raw tank used in the Institutional Chocolate Ice Cream. PritzkerOlsen, which underwrites Food Poisoning Bulletin, has filed a lawsuit against Blue Bell on behalf of a man who was seriously sickened after eating their ice cream. David Philip Shockley developed Listeria meningitis that left him with severe neurological impairment. Mr. Shockley worked at a retirement community that served Blue Bell ice cream. After becoming ill, he was hospitalized with a temperature of 107°F and lost consciousness. After regaining consciousness, he was unable to walk, talk, swallow, see properly, or move much of his body. He has completed weeks of inpatient rehabilitation and has moved back to his childhood home where his parents can care for him.